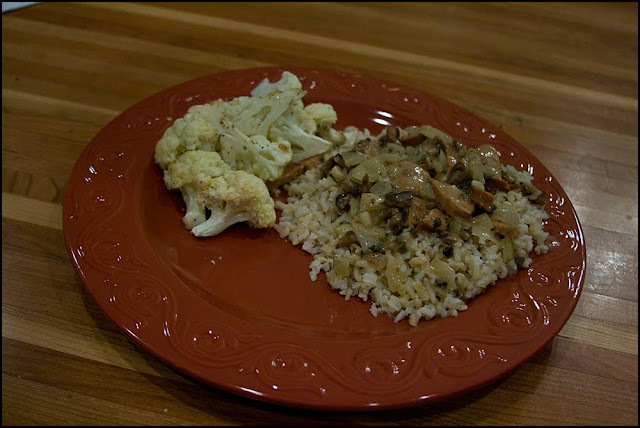 I served it with roasted cauliflower. Yummo! Enjoy! Ok, so the best part about this meal is the first step. 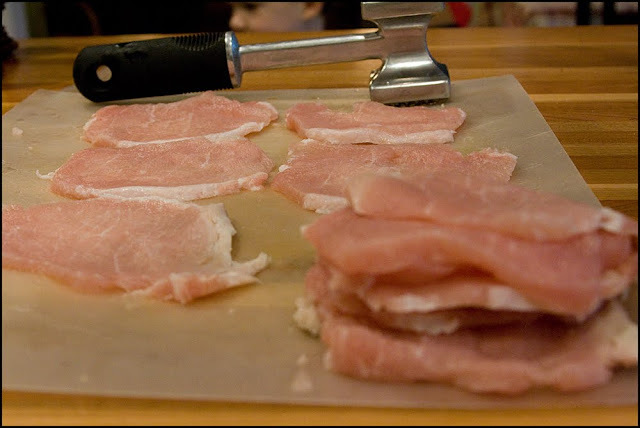 Grab your meat mallet and pound those morsels down to a thickness of 1/4″ to 1/8″ thick. I don’t know about you, but after a long day with the kids, breaking up fights, changing diapers, dealing with obnoxious customer service reps and the like, nothing feels more cathartic than taking a mallet to some meat. And yes, that’s one of my little munchkins flying by the camera in the background there. Got a love an active kitchen. Here’s what your pounded meat should look like. The pile is the before and the laid out meat is the after. I realize it’s not the best shot, but trust me that I pounded it plenty and enjoyed every last minute of it. Heat up 2 Tbsp of the butter and 4 Tbsp of the oil on medium high heat in a large skillet. Next you want to make up three shallow dishes. One will have your flour and pepper, one will have your beaten egg, and one will have your bread crumbs. 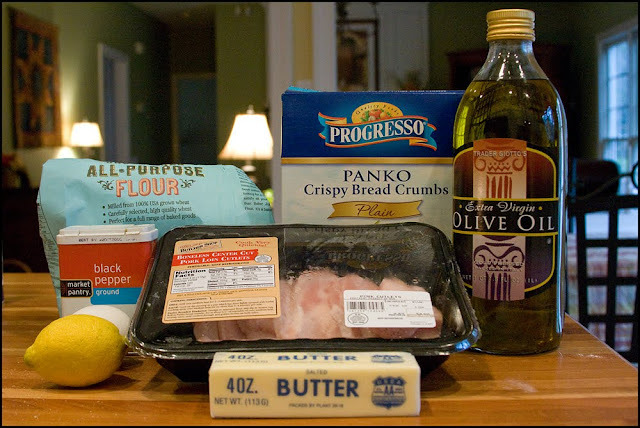 Dip a piece of pork in flour, then egg, then bread crumbs. Place in your skillet and cook for 2-3 minutes on each side or until cooked through and golden brown. You will most likely have to go in batches to cook all your pork. It took me about 4 batches and I switched out the butter and oil for fresh butter and oil (the other 2 Tbsp butter and 4 Tbsp oil called for in the recipe) about halfway through to keep it from burning and transferring to my pork. When finished, serve it with a slice of lemon and voila! 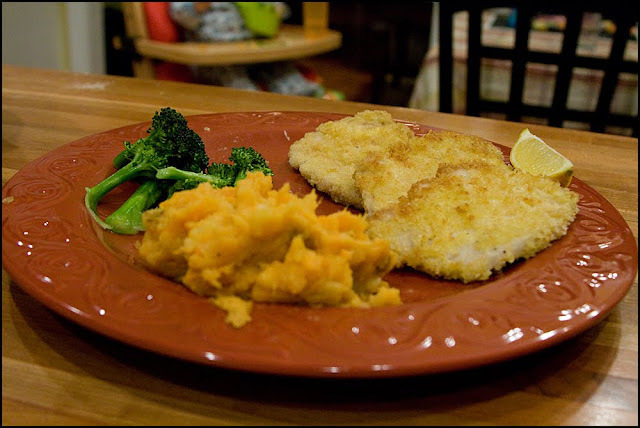 An easy, super yummy dinner everyone will enjoy. I served this with buttered broccoli and a little something I came up with on my own that I entitled potato smashup because it’s a combo of white potatoes and sweet potatoes with a bunch of extra yummy mixin’s. Look for that one to be posted soon! Hey! Hey! It’s a Cassoulet! 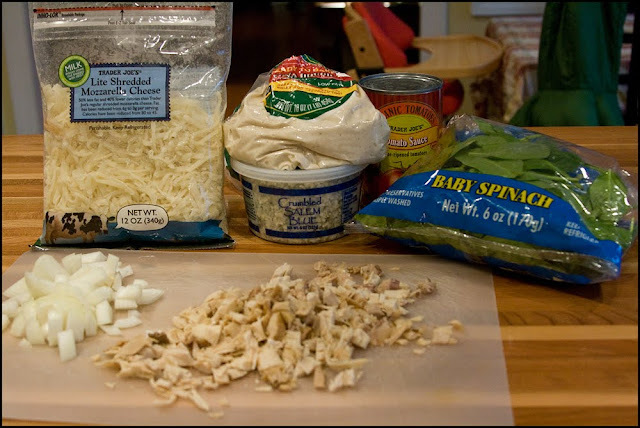 Mix together turkey, soy sauce, onion, mushrooms, salt and pepper in a medium bowl. 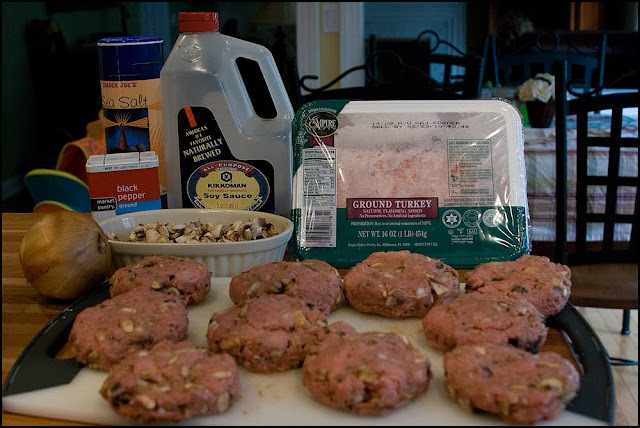 Form Turkey mixture into four bun sized patties. Place in large skillet and cook on medium high heat flipping once until cooked through; about 9-11 minutes depending on thickness. Turn heat down to medium and add one small handful of blue cheese to the top of each burger. Cover skillet and let sit until cheese is melting; about 3-5 minutes. 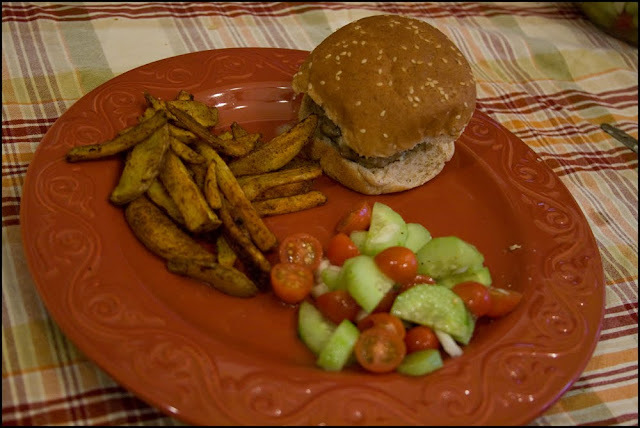 Place cooked pattie on a bun and enjoy! I love these just plain with ketchup, but they’re also killer with some tomato and avocado slapped on top. I just want to note that I leave the skin on my potatoes; vitamins and such. But if you prefer your skin removed, go ahead and get rid of it now. Next, slice your potatoes into wedges. 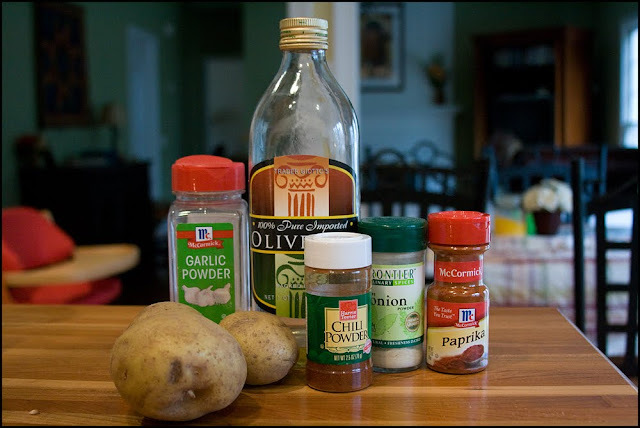 Combine the olive oil, paprika, garlic powder, chili powder and onion powder in a gallon sized ziploc (or whatever else you have on hand that can effectively coat fries). Now throw your wedges into the bag and coat those beauties up. 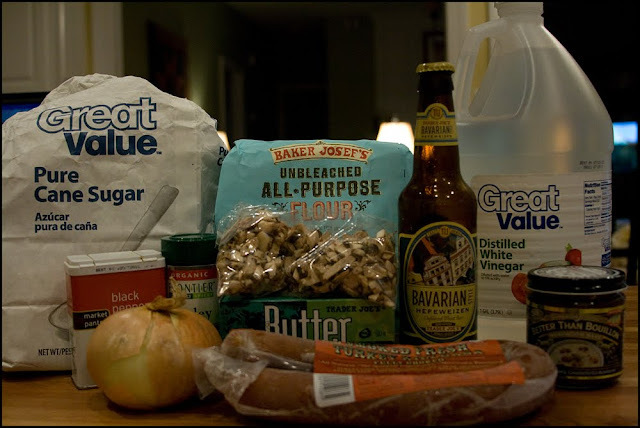 Dump your contents onto a large jelly roll pan and spread them out in a single layer. Pop them in the oven at 400 degrees for 20 to 25 minutes, being sure to turn the fries once. When they’re good and golden, pull them out and season with salt. Yummy! Place your cucumbers, onions, and cherry tomatoes in a medium bowl. Squeeze the juice of one lemon over the top and add in the olive oil. Combine. Season with salt and pepper to taste. Easy Peasy! And here’s the final plate. Yes, my food photography skills need work, but what can I say. My studio has been taken over by small aliens. Wait, those are my kids. Combine the soy sauce, sherry, sugar, ginger, and garlic. Pour the mixture over the fish and let it marinate in the fridge for 2 hours or more. Now for the mango salsa. I need to add, that the hot pepper and the hot sauce is an optional addition. I didn’t use them this time around mainly because of my three kids who aren’t big fans of spicy foods. If you do decide to use them, they can be added to the top of the fish before cooking; as much or as little as you’d like in spiciness. Ok, here we go with the salsa. Again, if you want spice, feel free to add a chopped jalapeno. I held off on spice because of the kids. Combine the Mango, bell pepper, onions, cilantro and jalapeno. Stir in the garlic powder, lime juice, salt, and pepper. Place salsa in fridge for 1 hour to give flavors a chance to meld. Heat a large skillet with 2 Tbsp of butter on medium high heat. Add Mahi Mahi to the skillet and squirt with lemon over the top of the fillets. Cook through, flipping once; about 7-9 minutes. 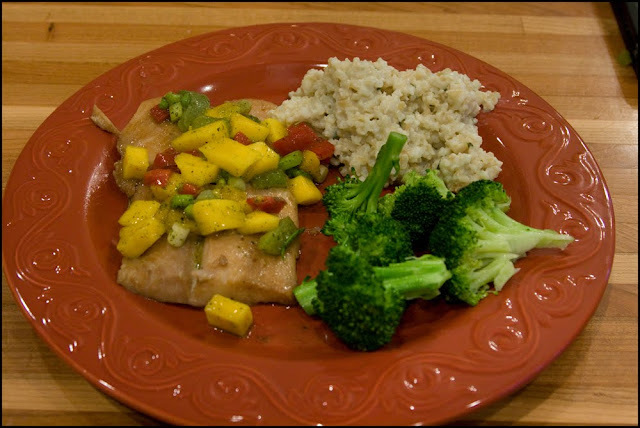 Serve hot with Mango salsa on top. Yummy! So here’s the final meal. I served it up with blue cheesy rice and buttered broccoli as side. Happy Eating! Here we go! It was another long day with the three amigo’s so on the menu last night was homemade pizza with any toppings I could find in the fridge. I managed to track down Trader Joe’s crust, Mozzarella cheese, spinach, onions, leftover teriyaki chicken from the previous night’s dinner and blue cheese. 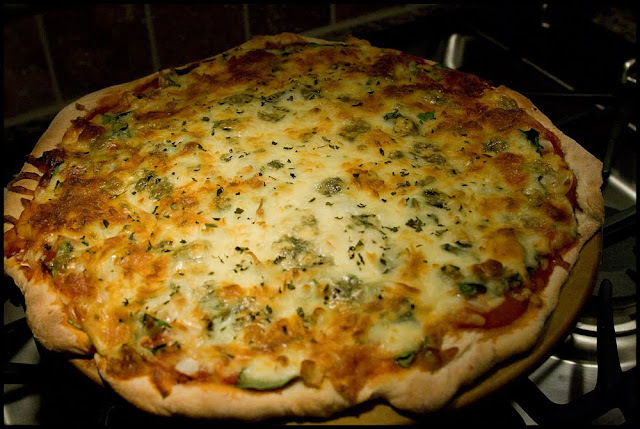 The tomato sauce was used to make some quick pizza sauce. For the pizza sauce I mixed together one clove of garlic, one tsp basil, one tsp oregano and a can of tomato sauce. Nothing fancy, but for a quick week night pizza, it does the job. 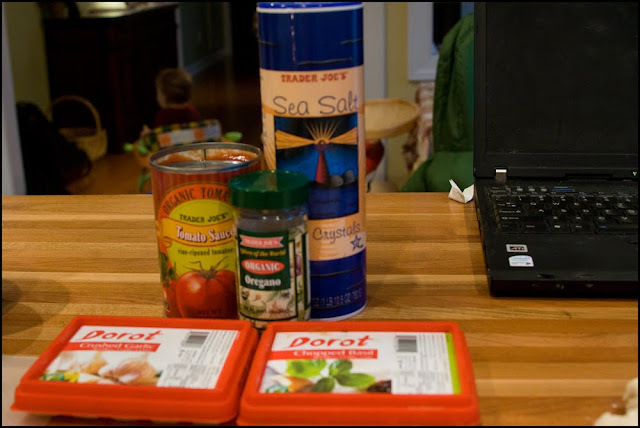 And speaking of garlic and basil, if you haven’t discovered Dorat (the red and white containers shown below) you need too! They are frozen versions of some of the more common spices such as fresh basil, cilantro, and garlic. One cube equals either a teaspoon or if you’re using garlic, one clove. Anyway, back to the pie. 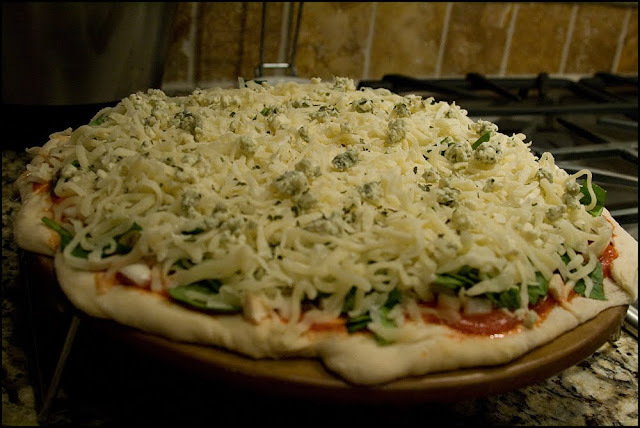 After chopping, dicing, mixing, and dough flattening, the pizza is assembled.